Last night’s community meeting to delve into the more technical aspects of CSG mining and the specific impact to the Mountain Districts aquifers explored a range of sobering areas. Kulnura local and Geotechnical Forensic expert Andrew Shirley spoke at depth on the risks posed to our aquifers by CSG mining. Julie Lyford, former Mayor of Gloucester nor full time activist and Chair of Groundswell Gloucester took time from her busy schedule to share with us a glimpse of the hard battle Gloucester residents are engaged in with AGL to stop the town and rich farming industry being decimated by CSG mining. Everyone also enjoyed a fantastic spread of cakes provided by the Gasfield Free Mountain committee. 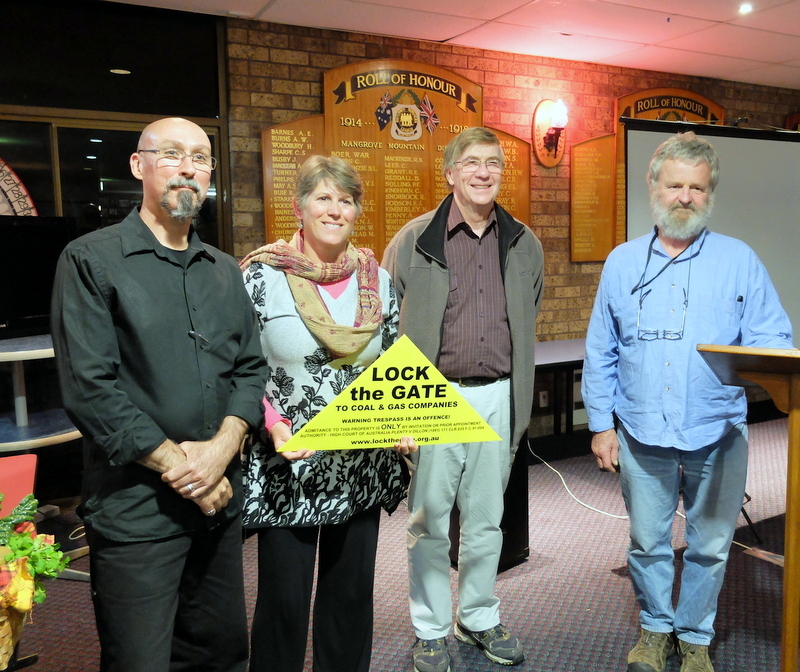 Pictured above (from left to right) Simon Perry (Co-convenor Gasfield Free Mountain Districts), Julie Lyford, Andrew Shirley, John Edye (Co-convenor Gasfield Free Mountain Districts). We’d again like to thank Julie and Andrew for their fantastic presentations and generosity in spending time to share their knowledge. A very thought-provoking session. Research shows power bills would not go down, but the coal and gas industry would reap a huge windfall should the Renewable Energy Target be scrapped, as is proposed by the Abbot government and their top business advisors. 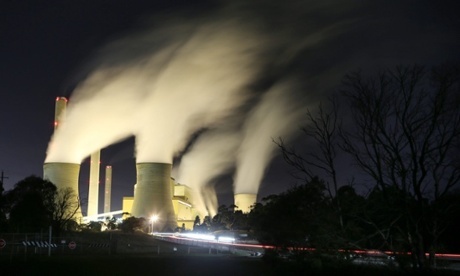 As reported in the Guardian newspaper “Coal and gas generators will reap $10bn in extra profits over the next 15 years if the Abbott government pares back the renewable energy target (RET), and the nation’s electricity bills will not fall, according to new research. Much as been said about the downward pressure CSG mining has on property values. Of course the CSG industry will say “bumf and nonsense” to such statements. Michael Fraser, Managing Director and CEO of AGL is due to retire next year, and he is perhaps feathering his retirement portfolio with a swag of properties the value of which have been enhanced through the installation of a few gas wells, flares, and compressors, a garden feature incorporating a waste-water evaporation pond, a pimp-my-truck styled drill-rig parked in the drive. “For those looking to buy a house in Sydney or an investment property in Sydney, the issue of CSG mining is a further and increasingly high profile example of the regulatory and environmental risks which can be encountered in the Sydney’s ever changing property market. The issue has both public and private elements. The public element is now well documented and centres around various environmental, health and safety risks associated with CSG mining especially to aquifers supplying water into the food chain and where the “fracking” extraction method is used. The private element is of particular interest to existing and prospective property buyers. It centres around the law and other guidelines under which a party becomes entitled to explore for and extract CSG. Curtis Associates go on to warn that it is difficult for a buyer to know whether a prospective property is subject to a CSG Petroleum Exploration License (PEL) and further that there is currently no law forcing sellers to warn a buyer of PEL coverage. They point to the Minview website as a resource people can use to see the gross coverage of the variously issued PELs across NSW, as do we. “(W)hile development consent from a local council or authority may be required before a petroleum title can be granted, property specific searches of such a council or authority will not reveal petroleum titles over other land on which CSG mining might be conducted and which might have subterranean or other environmental effects on the land being searched. Whilst it is possible to navigate through a series of steps on the DPI website to download an updated list of petroleum titles and applications, the particular difficulty with this type of property risk is that even if pre purchase due diligence uncovers a petroleum title affecting a property of interest, because of the exploratory element inherent in CSG mining and environmental effects that may be unknown (and in contrast for example, to a development consent for a new building), it is difficult to ascertain the future nature and extent of that risk. We’ve heard it said by property sellers and those representing them that A). CSG won’t come here and anyway if it did my land values would not be downgraded, if anything the fact that I’m getting a royalty for a gaswell on my land is only a good thing. More income means higher values; and B). All this community noise about CSG, the signs along the road about CSG meetings and the articles in the local press are putting off potential buyers. Clearly Curtis Associates has a lot to say about the validity of point “A”. The best way to retain the value of our land investments is for the community to collectively Lock Our Gates against the gas companies and Say No To CSG. As to the second point; blaming the presence of signs such as LTG Yellow Triangles and those erected to advise the community about CSG meetings for downward pressure on property values is a case of shooting the messenger. It is like a seller of water blaming the inventor of the microscope for the drop in the value of a glass of water when the microscope finds the water to be teeming with disease causing microbes. The facts of the matter are; we’re covered by AGL’s PELs and that fact, combined with the real possibility that mining could commence have the potential to exert a downward pressure on land values. Should mining commence, we will almost certainly find our land values decreasing to a significant degree. The visible presence of community resistance to CSG mining, such as signs, is if anything a fantastic boon for our community and sends a strong message to potential buyers that they are looking at property within a community that has both a backbone and sense of community co-operation toward the common good. The surveys of all the residents of the Mountain Districts are almost complete and collation of the data has begun; we’re on track to declaring Coal Seam Gas unwelcome and unwanted. PS. Don’t miss the Coffee, Cake and CSG session on the 23rd if you want to understand what happens underground when CSG mining occurs. AGL’s free reign a boon for NSW? Don’t believe it. The Telegraph’s article is based on a report by the Australian business analyst group ACIL Allen, a company that has a track record of producing industry sponsored reports that conclude that the Coal Seam Gas industry needs to be given a clear road ahead to just get on with saving the NSW state economy. In 2011 ACIL Allen published a report in conjunction with Santos that projected 2900 new full time jobs and over $15B added to the NSW State’s bottom line. In 2013 ACIL Allen published another report, this time for APPEA (Australian Petroleum Production and Exploration Association) which also concluded that NSW residents would see jobs and cash aplenty, if only all those pesky regulations holding back Coal Seam Gas drilling were removed. This time round it is AGL, and again the conclusion is that – silly us – we just don’t understand what is good for us and we all ought to get out of AGL’s and indeed the entire CSG Industry’s way and allow them to drill everywhere. The only problem that ACIL Allen finds is that the populist NSW Government has reduced the opportunities for the CSG Industry by unnecessarily imposing things like 2km buffer zones around residential areas. The pressure is not on the government to unlock the state’s coal seam gas fields, it is really on companies like AGL and Santos to take into consideration the collective will of the communities they target, from Gloucester to the NSW Northern Rivers, and through the Mountain Districts. Deloitte’s “Gas Market Transformations – Manufacturing Impacts Report” (July 14 2014) concludes that the price increases for gas that will result from CSG being exported for sale in Asia will have a net negative impact on the Australian economy, and specifically businesses in NSW. While the gas industry will enjoy an $11B boost, manufacturing, agriculture, construction and other industries will suffer a cumulative $32B drag. NSW is forecast to therefore see a negative economic impact of $21B, along with a share of the 12,000-14,000 projected job losses that the manufacturing sector will suffer Australia wide. The Coal Seam Gas mining industry is an insignificant employer and will go nowhere near making up for the employment losses felt elsewhere, throughout the country. At a time when the Australian manufacturing industry is already suffering from the withdrawal of major players including Ford and Holden such hits are very unwelcome news.